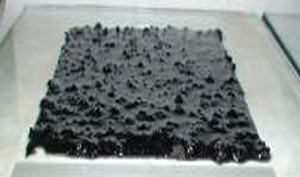 Asphalt-Rubber Aggregate Membrane (ARAM) applications are very different in comparison to other "rubberized" chip seals and products. 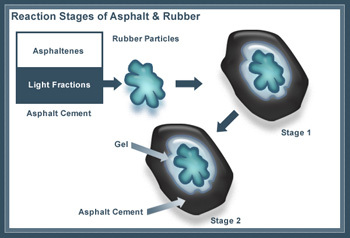 Asphalt-Rubber is the only product whose binder reacts with the rubber particles to form a hot, thick, viscous jellied composition for a significantly thicker binder application, better crack mitigation and performance. (In contrast, other "rubberized" products digest or "dissolve" the rubber.) At less than 1/2 inch thick, the ARAM membrane is thin and flexible, expanding and contracting with the various weather cycles to mitigate reflective cracking and maintain the integrity of the subgrade and final wearing surface. It also acts as a barrier to water intrusion. ARAM can be used as a final wearing surface, which is common practice for Caltrans on open, often rural, highways. ARAM can also be used as part of a composite layering system (ARAM Interlayers). In this instance, ARAM is "sandwiched" between layers, which may include a leveling course, slurry seal or final hot mix asphalt overlay. Arterial streets, highways and streets that are potentially targeted for reconstruction are usually the best candidates for these types of systems. ARAM has both a standard Greenbook and Caltrans specification, with decades of proven performance history in Southern California. 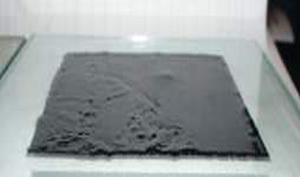 In addition, no other "rubberized" product has an equally substantial interlayer history. To find out more information about ARAM, call the WPMA at (213) 683-1300 or e-mail wpma@earthlink.net.